We’ve got our eyes set on a new piece of property and that means I finally get to plant the orchard of my CSA dreams. I’d love to hear the top 10 things you’d like to see in the CSA box in the future. We hope to include berries, a large fruit variety, enough eggs for everyone and possibly milk. This will be unraveling within the next few years, but any thoughts you have now, will help us make extraordinary CSA boxes in the future. 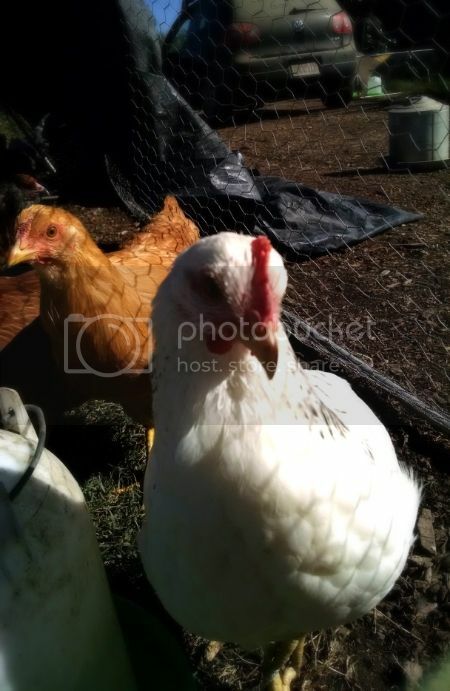 What’s happening with our chickens? Many people have signed up on our waitlist in anticipation of our eggs. We have about 28 laying hens at the current time producing about 10 dozen per week. We also have 4 different sets of 15 chickens being moved around on the farm to a new grassy location everyday. The grass is sparse and it’s becoming more difficult with the lack of rain. We’ve also found 2-3 roosters in each batch 🙁 anyone need a rooster? Seriously. If not, some will become dinner. The oldest chickens of the batch should be laying by the new year, and the rest will soon follow every month after. We will pleased when we can fulfill all egg orders and make sure you are eating the happiest chicken eggs around. Snapped a picture of one of my lovely ladies on the way out the door today. She’s no taller than a bottle of soda and gets super excited every time she’s moved onto new grass. Granola of the week: is Coconut Seed. Please see our store for a list of ingredients. This granola is PACKED with healthy pumpkin seeds and coconut flakes. It’s one of my favorites. Lightly sweetened and a perfect snack, it’s made right here in Goleta by Cindy Dollar. We’ve been subscribing to Deux bakery for several months now and we are trying to switch over to ALL organic loaves. In order to do that the price will go up a little bit and we do need a minimum commitment each week. We will start waiting lists for our organic bread and as soon as we get our minimum (6-8 people) we will begin the process. Please let me know if you have any questions regarding this matter. This entry was posted in Uncategorized on October 27, 2014 by Carolyn. Organic farming isn’t what it used to be. With government regulations, huge factory farms with special interests and insurance agencies to top it off, it’s amazing we can even find time to farm anymore. The Food Safety Modernization Act covers many recent regulations that the government has put into place. Seems like politicians created these laws in their office, instead of collaborating with real farmers. They force farms into clean houses, restricting farm animals/compost from interacting with the farm, pushing chemicals instead of hand workers, completing tons of paperwork for regulation and paying huge regulation fees. Not to mention that if you don’t comply to these standard you can not be insured and/or sell to your local stores. I think the future of our food is really going to have to be in our hands, our gardens, local farms and our back yards. I’m so happy to have a community dedicated to eating organic and local, and if you ever have questions about growing food in your back yard please let me know. While I’m a newbie at farming, it’s a life long pursuit! Sorry for the rant. I just feel a lot of these regulations happen behind the scenes leaving consumers unaware of the struggles their food has been through. We are back with granola of the week and it’s Pumpkin Pecan. This delicious granola can be made in Certified Organic OR Certified Gluten Free. If you do not specify you will receive certified organic. Please see our store for the full list of ingredients. This granola is locally made right here in Goleta. Our carrot tops are still suffering from mildew. We just started digging a new crop and the carrots are still too small to use. For the first time since I can remember we will not have carrots this week. Hopefully they will be back in action next week. If you purchase carrots in the store they will be bagged and we have a very limited quantity. 1.Prep work: Heat the oven to 300 degrees Fahrenheit for the squash. Bring a large pot of water to boil on the stove for the rice. 2.Cook the squash: Grease a large rimmed baking sheet or roasting pan. Whisk together the olive oil, 1 chipotle chile, adobo sauce, garlic, honey, and some salt and pepper in a small bowl. Taste and add another chile if you like. 3.Brush the glaze evenly over the squash skewers and roast for 45 to 60 minutes, turning once or twice and basting with any pan juices. When the squash is tender and deeply colored, remove the skewers from the oven and set aside. 4.To cook the rice: Once your pot of water is boiling, pour in the rice and give it a stir. Boil the rice for 30 minutes, then turn off the heat and drain the rice. Return the rice to the pot and cover the pot. Let the rice steam for 10 minutes. Remove the lid, fluff the rice with a fork, then mix in the lime zest and juice, lemon juice, cilantro, butter and salt to taste. 5.Cook the beans: In a 10-inch skillet over medium heat, sauté the onion and garlic in olive oil until fragrant. Add the cumin and stir until fragrant, about 30 seconds. 6.Pour in the beans and ½ cup water. Stir, cover and reduce heat to a simmer. Cook for 5 minutes, then remove the lid and use the back of a fork to mash up about ½ of the beans. Add the roasted red peppers, stir, and season with salt and pepper to taste. Cover until you’re ready to serve. 7.Serve the beans on a bed of cilantro lime rice. 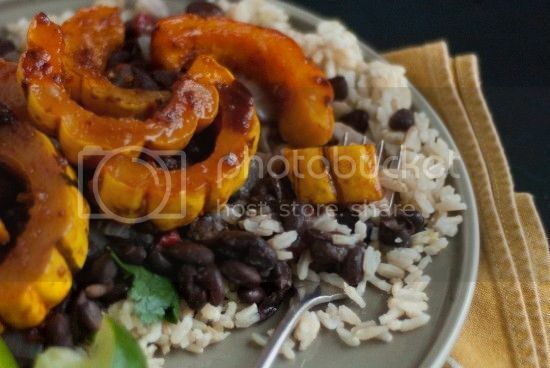 Top with chipotle-glazed squash. Garnish with a couple of lime wedges. Cut the tops off of the peppers and clean seeds out. Put a pot of water on to boil. Take one of the peppers and chop half of it for the filling. Put the 3 & 1/2 peppers into a pot of boiling water and let them boil for 5 minutes. Then remove them, drain any water, and salt the insides. 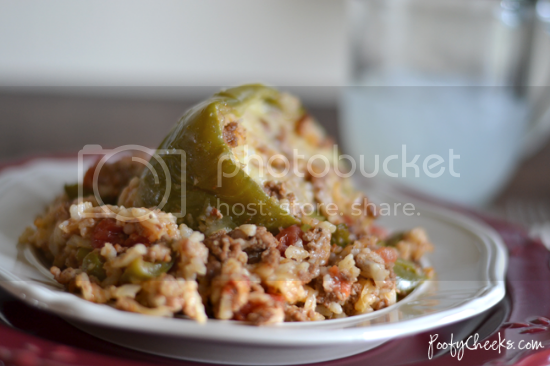 Cook the 1/2 chopped pepper, leek, and ground beef in a large skillet until beef is browned. Then drain the grease. Return the pan of peppers, leek, and beef back to the burner and add the rice, salt, Worcestershire sauce, tomatoes, and water. Bring the mixture to a boil and then simmer for 15 minutes. 1.Dice the avocado into 1/2 inch pieces, put in a bowl large enough to hold the whole salad, and toss with one tablespoon of lime juice. 2.Peel strips from the cucumber if desired, then cut into fourths lengthwise and slice into bite-sized pieces. Chop the cilantro and thinly slice the green onion. Whisk together the mayo and lime juice to make the dressing. 3.Add the chopped cucumbers, chopped cilantro, and sliced green onions to the avocado and gently combine. Add the dressing and stir just enough to combine. Drain the oil from the tuna and use a fork to partly break apart the tuna into chunks. 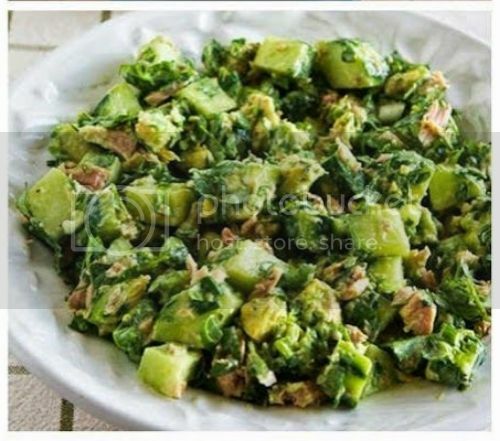 Stir tuna into the salad and GENTLY combine (don’t over-stir; you want the tuna to remain chunky.) Season to taste with salt and fresh-ground black pepper and serve. 4.This will last okay in the fridge for a day, but it’s far better freshly made. This entry was posted in Uncategorized on October 20, 2014 by Carolyn. This entry was posted in Uncategorized on October 14, 2014 by Carolyn. We don’t have a lot of tomatoes here on the farm, so we are picking Roma tomatoes for the share Tuesday morning. We are picking them from our Buellton property tomorrow and I will trek up there to make sure we have tomatoes in our shares this week. Bagged carrots will continue over the next few weeks, while the tops are not worth bothering with, due to the mildew. I think the chickens have been protesting the heat this week. They have not been laying a lot of eggs and we might come up short over the next few weeks. We have about 60 new chick-letts being moved daily in our chicken tractors. They are moved daily onto new grass and are fed worms and grain too. We can’t wait to introduce 15 new varieties of chickens (with different color eggs) into our coops and their eggs into your household come springtime. This entry was posted in Uncategorized on October 6, 2014 by Carolyn.